Yoga is the key to relieving long-term back pain, new study suggests. Review offers limited support for using yoga for back pain relief. Yoga is twice as good for easing back pain as other exercises. Yoga turns in so-so results for back problems. My interest was piqued. Were these conflicting headlines reporting on the same study? As I suspected, the answer was “yes.” A quick check confirmed that each was a different take on the same article: “Yoga treatment for chronic non-specific low back pain” (Weiland et al, 2017). Because I’m familiar with scientific research methods, I could easily skim the summary of the original article and draw my own conclusion. After just a few minutes of clicking through the online reports, I surmised that since the original study offered only modest, inconclusive findings, the journalists reporting on it sharpened their story-edge by interpreting them in more headline-worthy ways. I suspect, however, that it would be difficult for most yoga teachers to make such an assessment. As with most of the population, they’re generally unfamiliar with the admittedly arcane world of scientific research. And without some grounding in the basics, it can be difficult if not impossible for someone to interpret yoga research studies—particularly given the often-conflicting media reports on them. Nonetheless, even a simple orientation to the scientific research on yoga can help a lot. In this article, I offer a user-friendly intro to yoga-related research, designed to help non-specialists navigate it more easily. I also suggest reasons why yoga teachers and others might want to bother. This seemingly dry subject can be genuinely interesting and even useful to yoga teachers and practitioners. 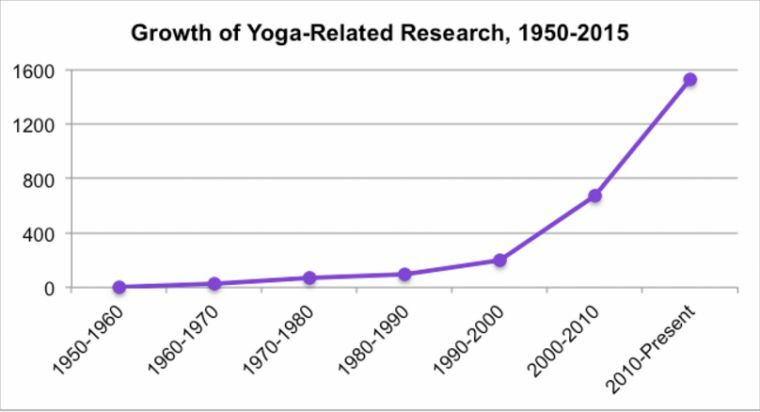 For starters, it’s helpful to know that there’s a lot of yoga-related research coming out these days. As detailed on the graph below, the number of relevant scientific publications increased dramatically during the last 15 years. To the layperson accustomed to being presented with scientific research findings as if they’re gospel truth, such a statement will undoubtedly sound strange. If there are so many studies of yoga, how can the field be described as “nascent”? It doesn’t seem to make sense. In a nutshell, the answer is that the multidimensionality of yoga makes it complex and difficult for scientists to study. To begin with, good scientific research on yoga requires defining precisely what’s meant by the term “yoga.” As anyone who’s ever engaged in a heated discussion on this topic knows, however, it’s not easy to say precisely what does and does not fall under the yoga rubric. “The fact that yoga is so multifaceted makes it difficult to study,” continues Prof. Schmalzl. “Asana practice involves a combination of physical movement, breath work, and mental attention. 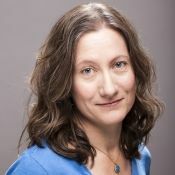 And that’s just for starters… other factors that can influence yoga-based outcomes include the teacher-student relationship, and even the experience of being in a particular space with a particular group of people on a regular basis.” A good research study should specify and account for as many such factors as possible, which is no easy task. Scientists also need to specify precisely what they hope to learn about yoga in their study. Of course, there are many different physical and psychological outcomes that can be examined in relation to yoga: Does it help low back pain? Alleviate anxiety and depression? Support recovery from addiction? No single study can consider all such potential benefits thoroughly. To be manageable, it’s necessary to narrow significantly the scope of the study. Scientists must also figure out how to create, as reliably as possible, the experimental conditions under which they can test whatever outcomes they want to study. For example, if you want to assess how well a particular asana method works to relieve low back pain, you need to make sure that each of its core components, including movement, breath, and attentional instruction, is specified. Then, you’d need to ensure that the teachers providing the instruction were sufficiently trained to do so consistently. Scientists should also consider the characteristics of the students receiving the instruction and whether those might explain whatever outcomes they find better than yoga. For example, if you want to study whether yoga helps alleviate depression, you should first assess whether the yoga students involved have a pre-existing history of depression—and that’s just for starters. Without doubt, other variables would be important to consider as well. I could go on about the complexities of the scientific study of yoga, but you get the point. It’s a challenging and difficult undertaking. Given the fact that complicated studies are expensive, and it’s difficult to fund good research on yoga, it’s not surprising that many of the studies we have aren’t as strong as we’d ideally like to see. Still, dedicated scientists are working hard to move the field forward. And progress is indeed being made. There’s now solid evidence that yoga helps relieve the symptoms of clinical conditions including cancer, chronic pain, PTSD, depression, and anxiety. Yoga has also been found to drive positive change in healthy people by increasing body awareness, brain activation, and emotional regulation. That said, the precise processes that produce such benefits are still not well understood. Of course, yoga is ultimately much more than asana, and its most profound outcomes cannot be measured. But its concrete benefits enhance the quality of countless lives, and scientific research can help us understand them better. In short, even if the scope and quality of scientific research on yoga is necessarily constrained, it still has enormous value. • How exactly do I define “yoga”? • How does that relate to how I define “asana”? • What are the core components of my asana practice? • Precisely, how do I teach and/or practice them? • What specific physical and psychological benefits do I expect this practice to produce? • How might I assess such outcomes systematically? • What other factors in myself, my students, or the practice itself might provide an alternative explanation for those outcomes? By the same token, yoga teachers working in environments such as schools and hospitals can improve the quality of their offerings by conducting simple in-house research. A well-designed pre-post survey linked to a specific curriculum and/or time frame provides helpful feedback for program improvement, as well as data that can be used to explain its benefits to other organizations and potential funders. In sum, it’s difficult to conduct sophisticated scientific research on yoga, and media reports on yoga research are often confusing. Nonetheless, it’s relatively easy to understand the essential elements of the research, and to even implement simple studies yourself. The process of learning to think about yoga more rigorously and logically is also very interesting, and it can also help yoga teachers become even better at sharing their knowledge with the world. Image source: Schmalzl et al, “Neurophysiological and neurocognitive mechanisms underlying the effects of yoga-based practices,” Frontiers in Human Neuroscience 9:235 (2015).